While the news is filled with articles about autistic children, these children are quietly growing into teens and young adults. Many want to go to college. But college is a lot more than just going to class and getting the work done. 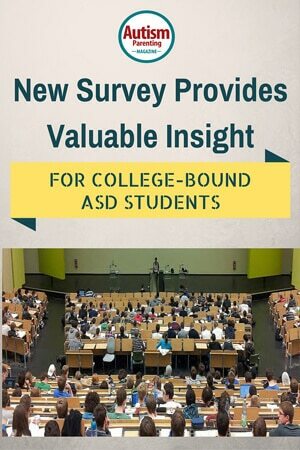 In an effort to help autistic teens prepare for college, www.ASD-DR.com sponsored a survey sent to autistic college students across the United States in June of 2015. What supports do you receive in college and how does it compare to high school? Surprisingly most respondents didn’t have any support in high school. It is clear from the responses received that utilizing available supports and accommodations are important to the success of students. Different colleges provide different levels of support and accommodations. It is important to understand what each student needs for support and check with colleges being considered. There may also be local services available that are unrelated to the college, but can provide the additional support needed. Respondents seemed to be evenly distributed between dorms, apartments and at home with family. “Home. I couldn’t cope with planning life at the same time. Home is safe. When choosing the ‘best’ living arrangement it is important to think about things like executive functions skills, shared spaces and social engagement. It is also important to understand how much control the student will have over their environment. A dorm where they must share a single room with one or more people may be too difficult, but a dorm where they have a bedroom and some shared spaces may be fine. A single dorm room by themselves may lead to isolation. In college where they live is much more than just where they sleep. Consider what kinds of living experiences they have had in the past. How do they do on vacation sharing a hotel room? Have they ever traveled with peers or gone to summer camp? Understanding what skills they have now and finding a living space that allows them to have a safe space will help them be successful in college. How do you keep track of classes and assignments? Paper planners and Google Calendar were the most common choices. Executive functions like organization and prioritization are often a struggle for autistic students. Consider using the same method of organization that worked in high school. Check into how the college tracks assignments. Talk to the school to see if there are any support programs specific to these skills. Autistic students are not the only ones who struggle with organization and prioritization as freshman in college so many schools have workshops or other programs for incoming students. Managing stress can be the single most important skill for autistic students to master. Students who are stressed can spiral into depression, lose focus, or shut down. The most successful students know how to identify the feeling of stress in themselves and have created a place they can go to decompress. Students who have a plan and know what has worked for them in the past are more likely to manage the new demands of college. It is also important to check into counseling services that may be available on campus. Some coping methods may no longer work in college or the stress may be much higher than expected. Students who are willing to ask for help are more likely to succeed. Self motivation was another area where students openly talked about struggling. Motivation is unique to each individual. For many students self-motivation is all about doing work in classes they don’t want to take or don’t have an interest in. It is important to choose as many classes as possible where the subject is interesting. For students who are still in high school and know they are not interested in a specific subject they can try to ‘test out’ of that subject through CLEP tests. Knowing that passing a test will keep you from having to take two years of a subject you hate may be enough motivation to study hard for the test. It is also important for students to find a tribe that is supportive. Family can be essential in promoting self-worth and keeping students focused on the goal. If you could go back in time and give a piece of advice to your high school self, what would it be? “Don’t be afraid to use the skills you do have (typing) to communicate your needs to adults – they love you and they will help you, whatever it takes. Experiences vary widely depending on each situation, but listening to those who have lived the experience is one way to get learn what may work best for you. Dawn Marcotte created ASD-DR.com to help autistic teens go to college. It provides a searchable database of over 300 colleges with autism support programs and advice from autistic college students.